The kitchen can be a daunting place, but the right set of cooking tools and cookware can help change that. Cooking is easier and more enjoyable when you use high-quality cookware and cooking utensils. High-quality cooking utensils are also much safer to use, so they’ll not only help you make delicious food but also reduce the risk of dangerous injuries. 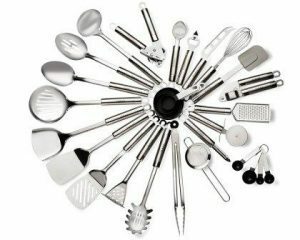 Cooking utensils can be made from a wide variety of materials, with one of the most popular being stainless steel. Stainless steel is a metal alloy that contains a small amount of chromium – about 10% to 11%. What’s great about stainless steel cooking utensils is that these utensils are rust-resistant and non-reactive. The chromium in the stainless steel forms a film on the steel’s surface when exposed to air. This helps prevent rusting. And since stainless steel cooking utensils are non-reactive, these tools are perfectly safe to use for acidic foods. Stainless steel cooking tools and cookware are known for their durability and versatility. These cooking utensils won’t bend or crack and they’ll look great even after years of use. They’re easy to clean, too. We have also written a complete guide about best stainless steel cookware sets. There are various types of stainless steel kitchen utensils you can get today. These kitchen utensils have different purposes, and they’ll make it easier for you to prepare and cook your food. Prep tools like knives, peelers, graters, and whisks make it easier for you to prepare the ingredients you need for cooking. Stainless steel knives are great because they resist rust and corrosion. Other prep tools like peelers and graters cut down your preparation time. Measuring spoons and mixing bowls help ensure that you get recipes right. Spoons have bowl-shaped heads that are ideal for stirring foods, whether you’re sautéing vegetables and meat or making a sauce. Solid spoons also make it easier for you to transfer foods between cookware. With slotted spoons, you can remove small pieces of food from liquids like soup, stock, or cooking liquid. Ladles have bowl-shaped heads that are broader and deeper. The handles are usually quite long so you can keep your hand away from hot liquids. Ladles are typically used for serving sauces and gravies. Turners have a flat, flexible head and a long handle. As its name implies, a turner is used for turning over food in the pan or for removing food from the pan. Turners usually have slots or holes so liquids can drain away from the food as it’s lifted from the pan. Tongs can be used to grip or turn foods. These kitchen utensils are great for handling heavy foods like meat, like when you’re grilling ribs or frying chicken. Barbecue tongs, for instance, make it safer and more convenient for you to grill meat over open fire. Stainless steel kitchen utensils are an excellent addition to your kitchen. Here are some benefits you’ll enjoy when you use stainless steel kitchen utensils. Withstands high heat – Stainless steel kitchen utensils can withstand high temperatures, making these utensils safe to use when you’re using high heat for your recipes. Highly durable – These kitchen utensils are very resilient; they resist cracking and chipping even after frequent use. Of course, these kitchen utensils are also impervious to rusting. Their durability also makes these kitchen utensils ideal for lifting heavy pieces of food from pans. Non-reactive – Stainless steel kitchen tools are non-reactive, so they’re safe to use for cooking a wide range of foods, including acidic foods. These kitchen utensils also don’t impact flavor quality since it doesn’t have a non-stick coating that will come off in the food you’re cooking. Easy to clean – Stainless steel kitchen utensils are often easy to clean. Most of these utensils can be cleaned just with soap and water, so cleaning up the kitchen when you finish cooking isn’t a complete nightmare. You may even be able to put these utensils in the dishwasher. Attractive, efficient design – Most stainless steel kitchen utensils are aesthetically pleasing, with a shiny finish that will look great in your kitchen. These kitchen utensils are ergonomically designed too, making them easier to handle. There is a wide variety of stainless steel kitchen utensils available today, so you have to be careful when choosing which cooking utensils to take home. Here are some important features you should consider. You want to get a stainless steel kitchen utensil set that offers a good variety of utensils. Most sets include a turner or spatula, solid and slotted spoons, a ladle, and a skimmer. There are kitchen utensil sets that offer more variety; some, for instance, include measuring spoons, tongs, whisks, and garlic presses. It all depends on which tools you need for your kitchen. 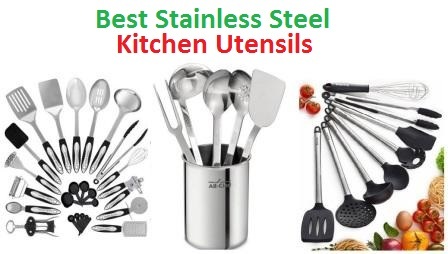 The right set of stainless steel kitchen utensils is ergonomically designed. These utensils should feel comfortable in your hand and have easy-to-grip handles, so you can use it for long periods of time without feeling discomfort. These utensils should also be lightweight yet sturdy. Stainless steel kitchen utensils are built for durability, thanks to their stainless steel construction. These kitchen utensils are resistant to rust and corrosion and won’t bend or break, so you can use them for many years. You may be able to find that some sets of kitchen utensils indicate the grade of stainless steel used in the utensils, like 18/8 and 18/10 stainless steel. The numbers indicate the amount of chromium and nickel, respectively, in the product. An 18/10 stainless steel kitchen utensil, for instance, contains 18% chromium and 10% nickel. Many sets of kitchen utensils come with extra features that may come in handy in the kitchen. Some stainless steel kitchen sets, for instance, may come with cases or carousels for hassle-free storage. Other stainless steel kitchen utensils are portable so you can take them with you whenever needed. There are also stainless steel kitchen utensils that you can put in the dishwasher for easy cleaning. Check out our complete guide about best stainless steel cutlery sets. The Joseph Joseph 95024 Elevate 100 Carousel Stainless Steel Kitchen Utensil Set features an ergonomic design for easy handling, with weighted handles that help you avoid making a mess in the kitchen. This kitchen utensil set also comes with a carousel for easy storage when the utensils aren’t in use. The Joseph Joseph 95024 Elevate 100 Carousel stainless steel kitchen utensil set contains 6 kitchen utensils, including a solid spoon, a slotted spoon, a ladle, a skimmer, a spaghetti server, and a slotted turner. With this excellent variety of utensils, you can easily whip up many recipes in your kitchen. With the set’s solid spoon and spaghetti server, you can even go from cooking to serving with this utensil set. The Joseph Joseph Elevate 100 Stainless Steel Kitchen Utensil Set has an excellent design. Each utensil is a nice length – about 12 inches – so it will keep your hand away from hot liquids. The utensils are sturdy but not heavy, making them easy to use even for long periods of time. The silicone handles are easy to grip and are heat-resistant, so these utensils won’t slip from your hand while you cook and will keep your hands safe. With this stainless steel kitchen utensil set, cooking your favorite foods is easy, even if you’re don’t have much experience in the kitchen. The Joseph Joseph Elevate 100 Stainless Steel Kitchen Utensil Set is made from high-quality stainless steel, so you don’t have to worry about these kitchen utensils giving out after frequent use. These kitchen utensils are made from 18/10 food-grade stainless steel, so these utensils are guaranteed to resist rust and corrosion. These utensils are completely safe to use for food preparation, too. These kitchen utensils are easy to clean. You can clean them with dishwashing soap and water or just put them in the dishwasher for added convenience. One great feature of the the Joseph Joseph Elevate 100 Stainless Steel Kitchen Utensil Set is that each utensil has a tool rest integrated on the handle. The tool rest ensures that the utensil’s head doesn’t ever come into contact with your counter’s surface. This helps you keep a cleaner kitchen and minimizes the mess that may come with cooking. The Joseph Joseph Elevate 100 stainless steel kitchen set also comes with a carousel with a spindle top and hooks from which you can hang each utensil. The rotating carousel stand keeps the kitchen utensils within easy reach, and it comes with a non-slip base, too. The All-Clad 6-Piece Stainless Steel Kitchen Tool Set with Caddy is a great starter set containing high-quality, ergonomic kitchen tools that will make for hassle-free cooking. Plus, this kitchen tool set comes with its own caddy. The All-Clad 6-Piece Stainless Steel Kitchen Tool Set with Caddyoffers a good selection of kitchen utensils, including solid and slotted spoons, a ladle, a meat fork, and a solid turner. With these kitchen utensils, you can handle most recipes and easily whip up gourmet meals. The All-Clad 6-Piece Stainless Steel Kitchen Tool Set with Caddyis designed with ergonomic handles that are grooved on top and rounded on the bottom. The kitchen utensils are 11 1/2 inches to 13 inches in length, so they’ll keep your hands at a safe distance away from the heat of the stove while allowing you maximum control. 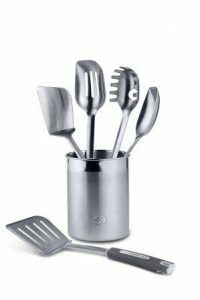 The All-Clad 6-Piece Stainless Steel Kitchen Tool Set with Caddy is made from sturdy 18/10 stainless steel. These kitchen utensils contain 10% nickel, which improves the utensils’ resistance to corrosion, so you can use this kitchen tool set for many years’ worth of cooking. Since they’re made from stainless steel, these kitchen tools won’t bend or break. This All-Clad 6-Piece Stainless Steel Kitchen Tool Set comes with its own caddy, so you don’t have to worry about storage for these kitchen tools. The caddy is made from the same stainless steel as the kitchen utensils, so the caddy is just as durable. This 29-Piece Stainless Steel Kitchen Utensils Set offers excellent variety – it contains everything from a potato peeler to a cheese knife to a strainer. All these kitchen utensils are made from premium stainless steel, so these will last through years of use. This kitchen utensil set offers an extensive variety of tools you can use. It contains 29 kitchen utensils for preparing and cooking food. A peeler, grater, strainer, spatula, potato masher, and can opener cut down your preparation time so you can finish cooking more quickly. Slotted and non-slotted turners, draining and serving spoons, a skimmer, and barbecue tongs help ensure that you can cook more efficiently. This stainless steel kitchen utensil set even comes with measuring spoons and measuring cups. The 29-Piece Stainless Steel Kitchen Utensils Set contains everything you need to be a pro in the kitchen. The 29-Piece Stainless Steel Kitchen Utensils Set is designed for easy use. The utensils’ handles are slightly bent so you can grip them better and avoid the mess that happens when kitchen utensils are dropped. The kitchen utensils are also heat-resistant, so you don’t have to worry about burning your hands as you cook. With their shiny, polished finish, these stainless steel kitchen utensils will look great in your kitchen, too. The 29-Piece Stainless Steel Kitchen Utensils Setis made from high-quality stainless steel. These utensils are safe from damage caused by rusting and corrosion. There’s a minimal chance of these kitchen utensils getting dents and scratches. They won’t chip away or bend, no matter how much you use them, making these utensils a great investment. This 29-Piece Stainless Steel Kitchen Utensils Set contains utensils that you might not even think you need, like a tea strainer and an extra-wide Asian turner. Having these unique utensils right in your kitchen might prove to be convenient one day. These kitchen utensils are also dishwasher-safe, so you can pop them in the dishwasher for a thorough cleaning. The HomeHero Stainless Steel Kitchen Utensil Set contains a wide variety of prep and cooking utensils that can make cooking fun and easy. For added convenience, these kitchen utensils are dishwasher-safe, too. This HomeHero Stainless Steel Kitchen Utensil Set offers a great variety of kitchen utensils. This set includes 25 stainless steel cooking utensils that will help you through the cooking process from start to finish. The set’s measuring spoons, cheese grater, potato masher, whisk, spatula, and tongs will help you prepare ingredients more efficiently, while the solid and slotted turners, solid and slotted spoons, and tongs ensure that you get recipes right. Cooking is a breeze with all these stainless steel kitchen utensils at your disposal. This HomeHero Stainless Steel Kitchen Utensil Set are designed for easy use. The kitchen utensils come in a variety of lengths, and all of them are perfectly sized for hassle-free handling. These kitchen utensils have a shiny finish, along with handles that are partially wrapped with a non-slip material. This material improves your grip on each kitchen utensil, reducing your risk for injury and helping you avoid making a mess in your kitchen. Holes on the end of the utensils’ handles make them easy to hang onto hooks in your kitchen. The combination of the black non-slip material and the polished look of stainless steel also give these kitchen utensils a sleek appearance. This HomeHero Stainless Steel Kitchen Utensil Setis made from 430-grade stainless steel. This type of stainless steel contains 17% chromium and .12% carbon. This makes these kitchen utensils highly durable and resistent to rust, corrosion, chips, and scratches. This kitchen utensil set is an excellent choice for any kitchen. The HomeHero Stainless Steel Kitchen Utensil Set includes some nifty gadgets that won’t necessarily help you cook but will help you handle food. The set’s pizza cutter, ice cream spoon, and wine opener will definitely come in handy during meals. Another great thing about the HomeHero Stainless Steel Kitchen Utensil Set is that it’s dishwasher-safe, making kitchen clean-up easy. This 23-Piece Stainless Steel Kitchen Utensil Set is made from high-grade stainless steel and it includes spoons, turners, measuring spoons, and measuring cups, so you’ll have everything you need in the kitchen. This 23-Piece Stainless Steel Kitchen Utensil Setincludes 23 tools that will make preparing and cooking food as easy as possible. The measuring spoons and measuring cups, along with the peeler, whisk, spatula, and grater, ensure that you get recipes right from the beginning. Slotted and solid spoons and turners help you cook food perfectly. This is a great set of stainless steel kitchen utensils that will get a lot of use in your kitchen. These stainless steel kitchen utensils are expertly designed, so you don’t have to worry about these utensils being unwieldy or too heavy. These kitchen tools are thin yet sturdy, so they’re reliable for safely handling even heavier pieces of food. The utensils even have a non-slip grip so you can rest assured that you can comfortably grasp these utensils when you cook. These stainless steel kitchen utensils look great, too, with their black handles and stainless steel bodies. This kitchen utensil set will look right at home in any kitchen. This 23-Piece Stainless Steel Kitchen Utensil Setis made from 304-grade stainless steel. This construction ensures that these kitchen utensils are durable. These utensils can withstand temperatures of up to 450 degrees, so you can use these with a wide range of recipes and cooking styles. These kitchen utensils are designed to be resistant to warping and bending. You won’t have to deal with pitting and staining with these stainless steel kitchen utensils, too. You can count on these stainless steel kitchen utensils to help you until you become a pro in the kitchen. This 23-Piece Stainless Steel Kitchen Utensil Setis easy to clean. You can use mild soap and warm water to clean the kitchen utensils and wipe them dry with a clean cloth to avoid spotting. These kitchen utensils are also dishwasher-safe for added convenience. 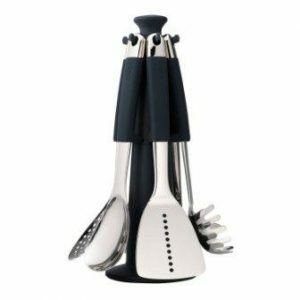 The Unique Effects Home Kitchen Utensils 5-Piece Set of Classic Designed Stainless Steel Cooking Accessories includes high-quality kitchen utensils that are not only resilient but also feature an attractive mirror finish. The Unique Effects Home Kitchen Utensils 5-Piece Set of Stainless Steel Cooking Accessories offers a simpler selection of kitchen utensils. This stainless steel kitchen utensil set includes a solid spoon for stirring and mixing, a ladle for serving soups or sauces, and a slotted turner for flipping foods. The set also comes with a skimmer for removing particles from the surface of broths or for lifting fried foods from oil and a meat fork for keeping roasts steady for carving. The Unique Effects Home Kitchen Utensils 5-Piece Set of Classic Designed Cooking Accessories is designed to make cooking easier. The utensils are 13 inches to 14.5 inches in length, so they’ll keep your hands a safe distance away from hot pots or pans. The handles are easy to grip, so you’ll have no problems wielding these utensils even for complicated recipes. The Unique Effects Home Kitchen Utensils 5-Piece Set of Stainless Steel Cooking Accessories is made from 410-grade stainless steel. This type of stainless steel contains 11.5% chromium, which makes these kitchen utensils resistant to rust and corrosion. These kitchen utensils are also non-reactive to mild acids in food. These stainless steel kitchen utensils are dishwasher-safe, so you can put them right in your dishwasher after a cooking session. The holes at the end of these utensils’ handles also make them easy to hang up and store in your kitchen. This Cheef’s 5-Piece Stainless Steel Kitchen Cooking Utensil Set is just what you need to master making your favorite meals. These kitchen utensils are made from brushed stainless steel for durability. The Cheef’s 5-Piece Stainless Steel Kitchen Cooking Utensil Set includes a great starting place for being a pro-level chef. 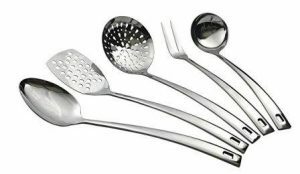 This cooking utensil set includes a skimmer, a serving spoon, a slotted turner, a ladle, and a spaghetti server.With these stainless steel kitchen utensils, you can easily go from cooking to serving. The Cheef’s 5-Piece Stainless Steel Kitchen Cooking Utensil Sethas an ergonomic design. Each kitchen utensil is perfectly balanced and is the right weight and size for comfortable use. The utensils’ handles are also slightly larger and have anti-slip features, ensuring easy control and fewer drops when you’re cooking. You can comfortably grip these stainless steel kitchen utensils for hours without discomfort. 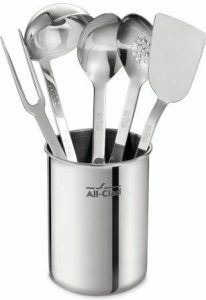 The Cheef’s 5-Piece Stainless Steel Kitchen Cooking Utensil Setis made from high-quality stainless steel. These kitchen utensils have met the strict standards of the FDA and LFGB, so you can be sure that these will resist damage and wear and tear. These kitchen utensils can even resist heat up to 410°F. Of course, these stainless steel kitchen utensils are also resistant to corrosion and rust. These stainless steel kitchen utensils are easy to clean with soapy water. You can also put these utensils in the dishwasher to save time. The handles on these kitchen utensils also have holes, so you can hang them up when they’re not in use. The Neet 7-Piece Stainless Steel Cooking & Serving Utensil Set offers all the basic kitchen utensils a budding chef needs. Plus, you won’t wear out these stainless steel kitchen utensils no matter how much time you spend in the kitchen. 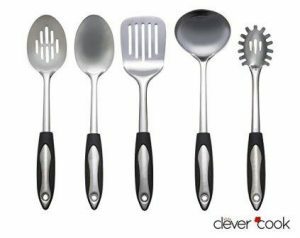 The Neet 7-Piece Stainless Steel Cooking & Serving Utensil Setoffers a great variety of kitchen utensils. This utensil set includes a solid spoon, a ladle, a skimmer, a slotted spatula, a wok spatula, and a potato masher. These stainless steel kitchen utensils will easily get you through many recipes. The Neet 7-Piece Stainless Steel Cooking & Serving Utensil Setfeatures a solid, seamless design that makes the utensils easy to handle. The utensils’ handles are easy to grip so you can enjoy comfortable control of the utensilswhen you’re whipping up your favorite meals. These ergonomic kitchen utensils are 13 inches long, too, so they’ll keep your hand at a safe distance from hot pans. 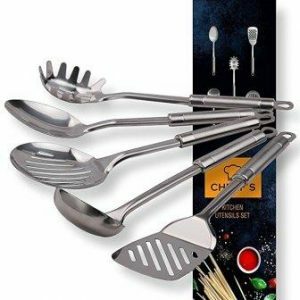 The Neet 7-Piece Stainless Steel Cooking & Serving Utensil Setis made from solid stainless steel, so you can be sure of these utensils’ durability. These stainless steel kitchen utensils will last through a lifetime’s worth of meals without breaking, bending, rusting, or chipping, making them an excellent addition to your kitchen. This stainless steel kitchen utensil set comes with its own utensil holder and organizer, so you can safely store these kitchen utensils when you’re not using them. The utensil holder is 16 inches tall, so it will keep the utensils off the surface of your counter. 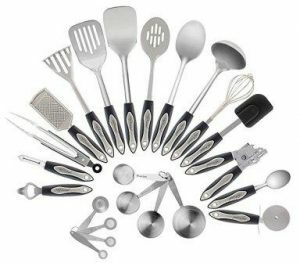 This NEXGADGET 38-Piece Premium Cooking Utensils Stainless Steel and Nylon Kitchen Utensils Set combine nylon and stainless steel for kitchen utensils that are flexible yet durable. Plus, these won’t scratch your non-stick pans. 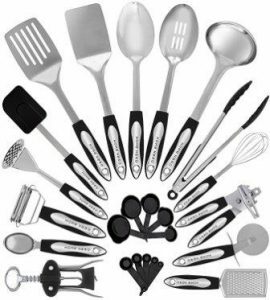 The NEXGADGET 38-Piece Premium Cooking Utensils Stainless Steel and Nylon Kitchen Utensils Set offers an extensive selection of kitchen utensils and tools. This utensil set includes various types of spoons and turners, as well as tongs, a meat fork, and a spaghetti server. You’ll also get a wide variety of prep tools such as spatulas, a whisk, a peeler, a grater, a bottle opener, and a can opener. The NEXGADGET 38-Piece Premium Cooking Utensils Stainless Steel and Nylon Kitchen Utensils Set has a versatile design that you’ll enjoy using in the kitchen. The utensils’ heads are made from sturdy nylon, while the handles are wrapped in stainless steel. 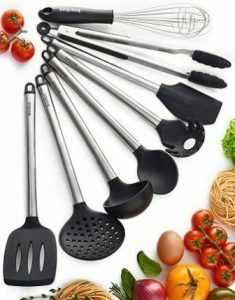 These kitchen utensils have ergonomic grips and large handles, so you can grip the utensils easily and more comfortably. The NEXGADGET 38-Piece Premium Cooking Utensils Stainless Steel and Nylon Kitchen Utensils Setis sturdy, and it’s designed for long-term use. The utensils’ nylon heads are sturdy yet flexible, so they won’t bend or break but they won’t scratch or scuff your cookware either. With their nylon heads, these utensils are heat-resistant up to 400°F. The stainless steel components in the kitchen utensils also improve their durability and help them last longer through frequent use. These stainless steel and nylon kitchen utensils are safe to put in the dishwasher, so cleaning up in the kitchen is easier. The utensils’ handles also have holes that let you hang up the utensils for hassle-free storage. The Braviloni 8-Piece Nonstick Silicone and Stainless Steel Cooking Utensils Set is made from both silicone and stainless steel, so these kitchen utensils won’t bend or break and they won’t scratch up your expensive non-stick cookware. The Braviloni 8-Piece Nonstick Silicone and Stainless Steel Cooking Utensils Set includes a great selection of cooking utensils. This utensil set includes a serving spoon, a deep ladle, tongs, a slotted turner, a flexible spatula, a 2-stage whisk, a pasta server, and a strainer. With these kitchen utensils, you’ll have the tools you need to create delicious meals. The Braviloni 8-Piece Nonstick Silicone and Stainless Steel Cooking Utensils Set is made from silicone steel and silicone. This versatile design makes these utensils flexible yet sturdy. The utensils’ silicone heads won’t scratch the surface of non-stick pots and pans. The utensils’ stainless steel handles are thick and ergonomic, so you won’t have problems handling the utensils as you cook. These Braviloni kitchen utensils are highly durable. The utensils’ silicone heads can tolerate high temperatures of up to 400°F, so the silicone won’t melt even when you leave them in the pan during cooking. Top-grade 304 stainless steel improves the utensils’ durability, so these won’t bend or break like plastic or wooden kitchen tools. These stainless steel kitchen utensils are resistant to rust, too. The Braviloni 8-Piece Nonstick Silicone and Stainless Steel Cooking Utensils Setis FDA-approved and is free of BPA and latex, so these are completely safe to use for cooking. These utensils are easy to clean, too. 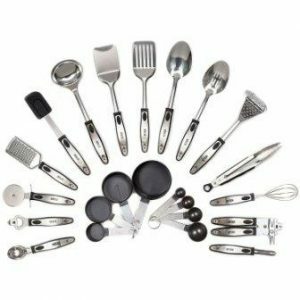 The Laxinis World26 Piece Kitchen Utensils Set & Cooking Tools, Stainless Steel & Nylon Gadgets is a complete set of essential kitchen tools, so you won’t have to buy each tool individually. A nylon and stainless steel construction also makes these utensils versatile. 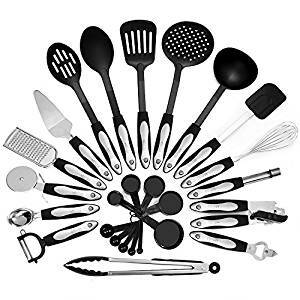 The Laxinis World26 Piece Kitchen Utensils Set & Cooking Tools, Stainless Steel & Nylon Gadgetsincludes a full set of tools that will come in handy in your kitchen. Measuring cups, a bottle opener, a can opener, an apple corer, a whisk, and a grater help you properly prepare foods for cooking, while tongs, solid and slotted spoons, a slotted turner, skimmer, and ladle help you cook more efficiently. Serving tools like a pie server, a pizza cutter, and an ice cream scoop are handy to have in the kitchen, too. 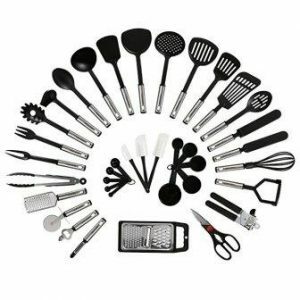 The Laxinis World26 Piece Kitchen Utensils Set is designed for easy use and maximum control. The kitchen utensils’ handles are made from stainless steel and nylon, so these are easy to grip as you’re cooking. Plus, the nylon heads on these cooking utensils ensure that you won’t scratch up the non-stick surface of your expensive cookware and bakeware. The Laxinis World26 Piece Kitchen Utensils Set will last through many years of use. These kitchen utensils combine nylon and stainless steel, so you get the perfect mix of flexibility and durability. The premium stainless steel in these kitchen utensils makes them durable and resistant to rust, corrosion, and staining. The kitchen utensils’ nylon heads can also resist high temperatures, as the nylon material is heat-resistant up to 450°F. This Laxinis World26 Piece Kitchen Utensils Setis safe to put in the dishwasher, making kitchen cleanup easy. Each kitchen utensil also has a hanger hole on the end of its handle, so you can easily put the utensils away after washing. The Calphalon 6-Piece Stainless Steel Utensil Set contains high-quality kitchen utensils made from premium stainless steel. Plus, the kitchen utensils’ solid design ensures durability and ergonomic use. The Calphalon 6-Piece Stainless Steel Utensil Set includes a great selection of tools to start cooking with. This stainless steel utensil set includes slotted and solid spoons and turners as well as a pasta fork for serving pasta. 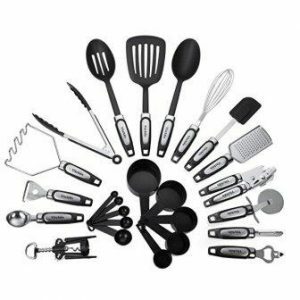 With all these kitchen utensils, you can handle any cooking style and recipe that you want to do. The Calphalon 6-Piece Stainless Steel Utensil Sethas an efficient, ergonomic design that will make cooking easy. The kitchen utensils have specially designed corners so you can quickly reach the edges of pots and pans. The solid and slotted turners are designed with thin, low-profile heads, making them easier to slide under foods. Plus, the turners have serrated edges, so you can do some quick slicing in the pan if needed. The spoons have a flat edge that makes it easier for you to scrape the bottoms of pans, too. These Calphalon stainless steel kitchen utensils are comfortable to use, too, thanks to soft-touch silicone accents in the handles. The Calphalon 6-Piece Stainless Steel Utensil Setis designed from top-quality stainless steel, so these are durable and will last against the wear and tear of frequent use. The utensils are also oven-safe up to 500°F. Extra featuresOne great extra feature of these Calphalon stainless steel kitchen utensils is that the utensils come with a stainless steel crock for easy storage. The utensils are dishwasher-safe, too. The Yitchen 25-Piece Stainless Steel and Nylon Kitchen Utensils Set contains all the prep tools and kitchen utensils you need to become a pro in the kitchen. Plus, the combination of nylon and stainless steel makes these kitchen utensils durable. The Yitchen 25-Piece Stainless Steel and Nylon Kitchen Utensils Set offers a wide variety of prep tools and kitchen utensils that you’ll love using. With this set, you’ll get measuring cups, a peeler, a bottle opener, a can opener, a spatula, and a whisk for preparing the foods you need for your recipes. Of course, this ktichen utensil set also includes a slotted spoon, a slotted turner, a ladle, and tongs, so you can easily handle the food you’re cooking. The Yitchen 25-Piece Stainless Steel and Nylon Kitchen Utensils Setis expertly designed to ensure ergonomic, comfortable use. Many of the prep tools in this set are made from stainless steel, so these will be more reliable at doing their jobs. The heads on the spoon, the turner, the ladle, and the tongs are made from nylon, so these won’t scratch or scuff your non-stick cookware. These kitchen utensils have non-slip grips that make them easier to control as you’re cooking.This way, you can cook more efficiently and avoid mess up the recipes you’re working on. The Yitchen 25-Piece Stainless Steel and Nylon Kitchen Utensils Setis designed for durability, with their construction of a combination of stainless steel and nylon. These kitchen utensils are flexible yet sturdy enough to handle large quantities of food. These stainless steel and nylon kitchen utensils can take you from cooking to serving, especially with utensils like the cheese slicer, ice cream scoop, and pizza cutter. With its many prep tools to its sturdy cooking kitchen utensils, the HULLR 23-Piece Stainless Steel Kitchen Utensil Set is a complete set that any budding home cook will love. This HULLR Stainless Steel Kitchen Utensil Set contains 23 individual tools that will all help you feel at ease in the kitchen. This kitchen utensil set includes prep tools like measuring cups, measuring spoons, a peeler, a spatula, a potato masher, a whisk, and a grater, so you can zip through prepping your food. You’ll also cook more efficiently with the set’s ladle, solid and slotted spoons and turners, and tongs. The HULLR Stainless Steel Kitchen Utensil Set features an excellent design. Ergonomic handles make these kitchen utensils easier to use in the kitchen, no matter what type of food you’re dealing with. The secure grip provided by these utensils help you avoid injuries, too. This stainless steel kitchen utensil set is made from high-grade, top-quality stainless steel, so you can rest assured that these kitchen utensils won’t bend or break. The kitchen utensils also resist rust and corrosion. The HULLR Stainless Steel Kitchen Utensil Setis completely dishwasher-safe, making kitchen clean-up fast and convenient. The Clever Cook 5-Piece Stainless Steel Kitchen Utensil Set offers a basic variety of kitchen utensils that will give you an easier time in the kitchen. The Clever Cook 5-Piece Stainless Steel Kitchen Utensil Setincludes a great selection of cooking utensils. This kitchen utensil set offers slotted and solid spoons, a slotted turner, a ladle, and a pasta server. With these kitchen utensils, you can whip up nearly any recipe you want. These Clever Cook kitchen utensils come with rubberized handles for a non-slip grip that ensures hassle-free cooking and less mess in the kitchen. The rubberized handles also eliminate heat transfer, so you can avoid getting injured and enjoy maximum comfort as you cook. The Clever Cook 5-Piece Stainless Steel Kitchen Utensil Setis crafted from top-grade stainless steel. With their stainless steel construction, these kitchen utensils won’t break or chip away. Plus, these kitchen utensils are heat-resistant up to 500°F, so they’ll withstand most cooking styles. These utensils will be sturdy enough for years’ worth of frequent cooking. The Clever Cook 5-Piece Stainless Steel Kitchen Utensil Setis easy to clean after use. Just pop the utensils in the dishwasher and they’ll be good to go. Once these utensils are dry, you can hang them up on hooks using the holes in their handles.